Join us June 24-26 in Myrtle Beach, South Carolina, for the PFI Annual Conference - only 11 weeks away! Beginning next week I'll begin a stretch of travel that will find me talking about the ambitions of the Pellet Fuel Institute to both large, international audiences as well as audiences with more localized goals. I've been a part of both of them before and I look forward to each. The International Biomass Conference & Expo served as my introduction to the broader biomass-to-energy sector. I attended the very first Biomass Conference & Expo in 2008 and have been to every one of them since. It has been my great pleasure to organize the conference since 2010 and for at least five years I've been fortunate enough to act as emcee and moderate the opening general session. It was on this panel that my first conversations with the Pellet Fuels Institute were had. This year, the moderating duties will be taken over by Anna Simet, editor of Biomass Magazine and I'll be moving a few chairs over, representing what we're up to here at the Pellet Fuels Institute. Anna and I have compared notes and I'm looking forward to answering questions about our goals at PFI and the critical importance of growing the number of pellet appliances sold in this country. A number of PFI members will also be in Atlanta as well as some who are not yet members. I look forward to catching up with our current members and sharing our vision for the PFI moving forward with them and other producers while I'm there. In less than a month, I'll make the short commute to Carlton, Minnesota for Heating the Midwest, a regionally focused gathering of biomass heating in the region. The Pellet Fuels Institute is a proud co-host of the event and I'll be talking during the conference's first morning. As an upper-Midwesterner AND a pellet enthusiast Heating the Midwest is a perfect fit. In fact, I've bookmarked this Heating the Midwest web page and find myself looking through the data they've pulled together. 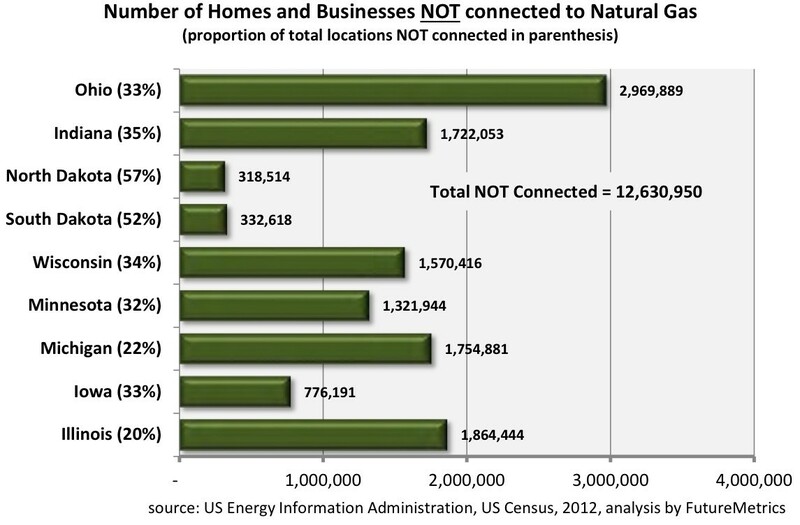 Consider this from the website: U.S. Energy Information Administration and U.S. Census data were analyzed by FutureMetrics, which found that nearly 5 million homes in Minnesota, Wisconsin and Michigan are not connected to natural gas infrastructure. In the context of Operation 100k the Upper Midwest has to be on our short list of markets where we can find new pellet buyers. I look forward to speaking with my colleagues not only in the sector, but also in the region about how we might best go about getting this done. If you'll be at either of these important industry events please say hello. I look forward to seeing you. All PFI members are encouraged to submit names to the Nominating Committee of people you'd like to see leading PFI. Please send nominations to [email protected] by April 27th for names to be considered. Only 11 Weeks Till the PFI Annual Conference in Myrtle Beach! It's not too early to register for the PFI Annual Conference taking place in Myrtle Beach, June 24-26! The conference is earlier in the summer than in years past, and hotel rooms are already half reserved, so don't let it sneak up on you. We're building a collection of photos of our members, their pellet mills and product. Send them to Carrie Annand at [email protected]. Thanks to Stan Elliot with Pacific Coasts Pellets for the above photo. Are there any topics that you'd like to see addressed at PFI's Annual Conference in June? We'd like to hear from you. Nominate speakers, suggest panels, experts, themes and ideas. The Conference Committee wants to be sure to reflect the preferences and needs of PFI membership as much as possible. Be sure to check our updated online calendar with information on many events happening during 2018. Most important, mark your calendars for next year's PFI events! Mitch Lehn, human resources director for Lignetics, Inc., said Thursday that his company has purchased all of New England Wood Pellet's assets, which includes the flagship location in Jaffrey and four manufacturing plants throughout the northeast part of the country. "This acquisition allows us to fill a geographic void," said Lehn. "This is a significant capacity increase for us... it allows us to be more competitive." Lignetics is the largest residential wood pellet manufacturing company in the United States and now has a production capacity of about one million tons of wood pellets per year. Lignetics is the only pellet manufacturer that has manufacturing plants in the eastern, central, and western parts of the country. FutureMetrics' partner and operations expert, John Swaan, entered into the first offtake agreement for bulk pellet delivery from north America, produced the pellets at his pellet plant in Prince George, B.C., and loaded the ship in Prince Rupert, B.C., on Feb. 9, 1998. After a long transit from the west coast of Canada to Europe, the ship was unloaded in Helsingborg, Sweden for use as fuel by Helsingborg Energi. The opening of the new biomass project has been a long time coming, but it is finally here. On Friday, April 6, the Sierra Institute will introduce the working biomass system at the county's Health and Humans Services Center through a ribbon cutting ceremony. After three years of hard work by the county, and the Sierra Institute, the state of the art facility will offer heating for the large building. The Sierra Institute works to promote healthy forests alongside rural communities and has been working with the county on establishing an affordable and effective heating system to replace the geothermal heating system at the county annex building. The geothermal system proved to be inadequate to effectively heat the building. The biomass system will run through the geothermal system and heat the building. It also will be fueled by forest clean-up projects and wood chips. The wood chips will be provided by timber companies throughout the county who work to clean up their own lands. The wood chips offer a market for small or unhealthy trees, and an incentive to keep forests clean.